Do you remember this shirt?? It’s from a What-I-Wore-Wednesday,HERE, but it went CRAZY on Pinterest because people thought it was a tutorial. 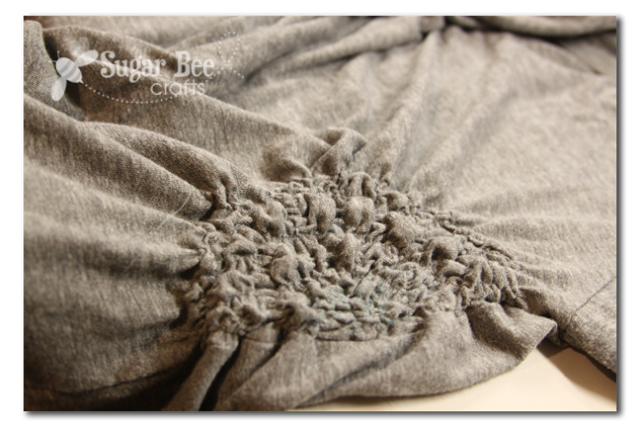 Side Gathered Shirt – Tutorial. So, let’s delve on in…. –>you’ll also need elastic thread. Don’t be scared of it – it may be your new best friend! 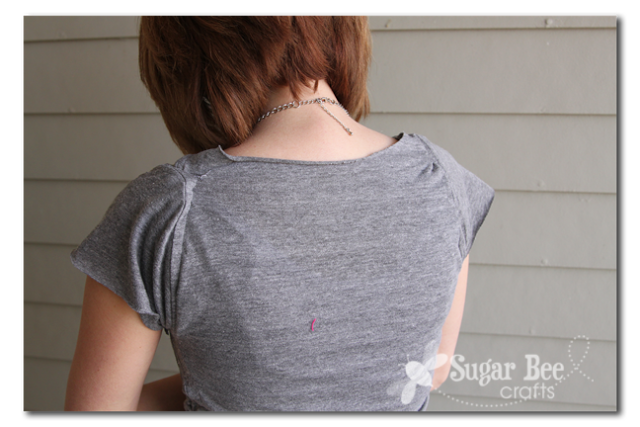 I love sewing with elastic thread – it just makes things more fun. So, handwind your elastic thread on your bobbin. Also, you can change your needle to one for knits if you want. Now, I made the side gathering first, and then altered the shirt to fit me. In hindsight, I wonder if I should have altered the shirt first and then gathered the side. It’s several half-circles, all looped. I used a fabric marker to draw on my shirt the first row, but just eyeballed it after that. I’m not going to say this was easy – it’s a bit tricky. It does get better as you work your way out from the middle, so stick with it. Try to hold your shirt flat as best you can and that will help. Phew, done! Here is what my front looks like – not exactly like the original shirt, but pretty close. If my loops were uniform, it would have come out better, but loops are so hard to sew! 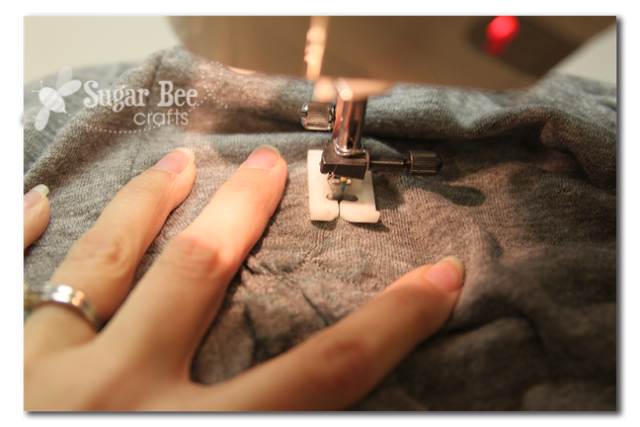 Making tight turns is tough – a hint, you can’t tell they’re precise loops in the end, so I made a lot of mine triangles – sewed a little, put the needle down, pivoted, sewed a little, put the needle down, pivoted again. I started by turning it inside out and sewing on that dotted line, taking in several inches. After that I kept trying it on and taking in different spots – shoulders, more on the sides, etc. It was tricky and it’s still not quite right. 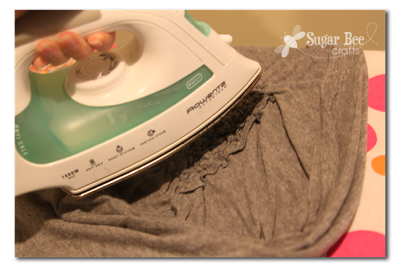 Kudos to all you who refashion giant tshirts – it’s tricky! For the neck and arms I ended up just cutting off the ribbing and leaving it as-it. I tried to hem it in a spot but it was really puckery, so I unpicked it and thought leaving it looked okay and just went with it. But overall, I’m pretty happy with my first attempt – you’ll have to let me know if you give this a try!! Enjoy your Side Gathered Shirt!! « Stamps – do you have one?? I love it – you always knock it out of the park! I really have to try elastic thread,that looks like fun. I think it looks great! And that “tuck” in the front…looks like it goes there. 😉 Great job! Thank you, Mandy! I’m one of the one’s who pinned the original shirt on Pinterest but was sad there was no tutorial for it. So cute!!! That is so awesome! I wonder if I used a Maternity Top if I could save a step of altering the shirt. That is the part that would scare me the most. The elastic thread seems straight forward enough. I love this shirt and will definitely be putting it on my to do list. It looks fantastic! I bet you’ll get a lot of compliments on it! Cool–now this one can go all crazy on Pinterest too 🙂 Man, I love that place! This turned out really cute – you are so TALENTED!! Thats awesome ! nice job!!!!! This is awesome! I actually like your version better than the original. Nice job! How cute! I’m so jealous of women that can sew! 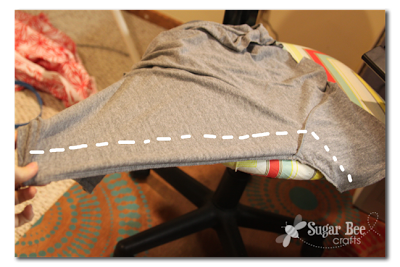 Me and sewing… do not co-exist! Instead… give me paints and walls! LOL! That is pretty awesome! I didn’t see any of the issues until you pointed them out. Thanks for sharing this. Thanks for the tutorial! I am now on the hunt for a shirt to try this! I have to try this. I get several free t-shirts when I do volunteer work and I’m always looking for a new way to “doctor” them. It looks great and I love the idea of using a maternity shirt; that way it would fit in shoulders; that part scares me too. Never used elastic thread, but you make it sound easy! Great job! You nailed it! 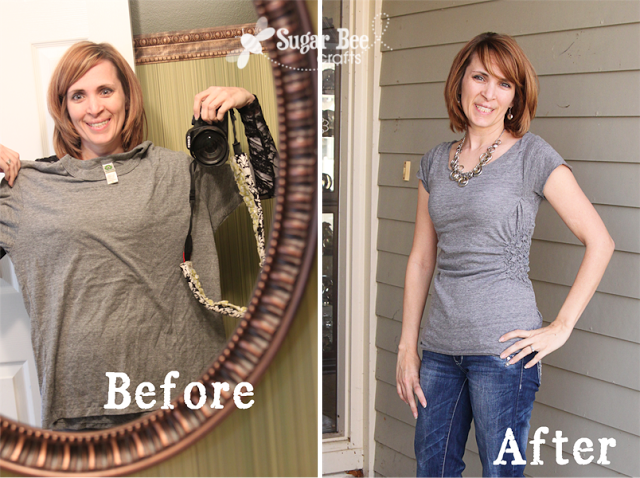 I love the top – great job and thanks for taking the time to share the tutorial! This shirt looks great on you and is very flattering. I like the way it gathers and cinches off to the side. Great job as always!! That is so cool!!! I love your version! I love your smocking details! 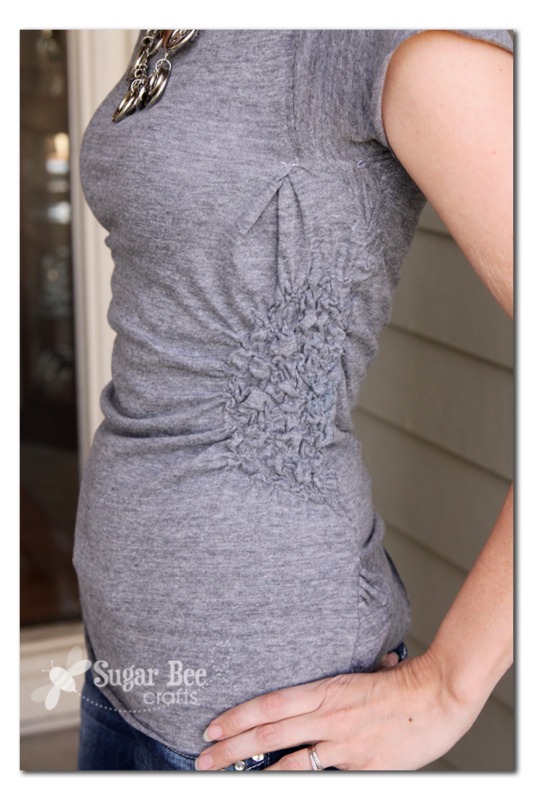 I am curious if a maternity style shirt would work better then men’s. Since it would still be smaller through the top and arms, but have room in the stomach area. Maybe you could do the shirring without so much resizing?! IDK? Very cute, the original and the repurposed version! Sorry OurForeverHouse, just saw your comment about the maternity shirt too! I think a maternity shirt is a great idea!! this looks so good! wonderful job! THat is so cute!!! Wow! Awesome job! Love the necklace too! I am featuring this today at somedaycrafts.blogspot.com. Looks great! I bet it´s supersoft. 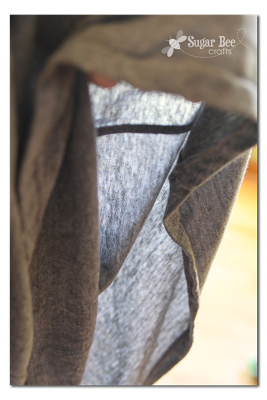 Although, I believe the original shirring is actually shibori with elastic thread.¿What do you think?. Awesome! I guess I really need to get familiar with elastic threading… this is not the first thing I’ve wanted to make with the stuff. When I refashion t-shirts, I’m working with oversized, already owned shirts. I cut off the sleeves and then reattach them after I cut it to fit the kind of sleeve I want. That would take care of that weird underarm thing you have going on. i think your knockoff looks better!! Makes me wish I had a half-decent sewing machine! I love practical projects like this! This looks so good! 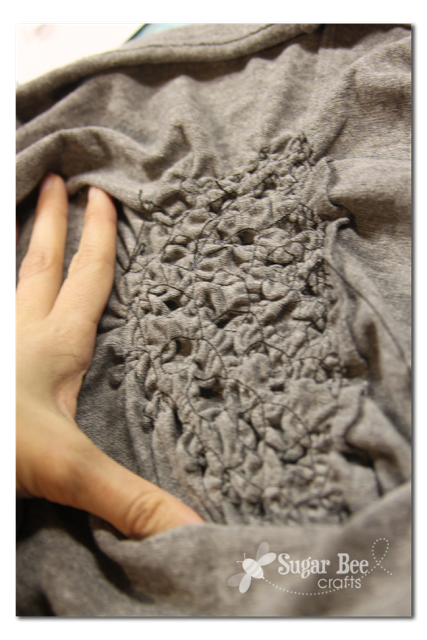 So jealous that you know how to sew like that, but am inspired to try something like this once I get a sewing machine! Great job! That is awesome! The finished product is SO cute. Thanks for sharing! Seriously adorable!! 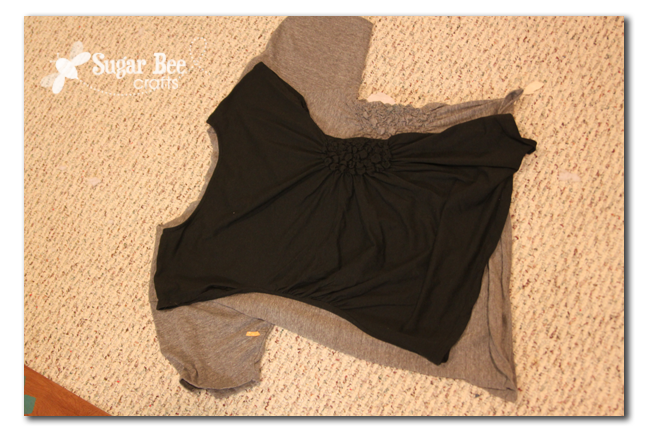 I love this idea of using an old shirt to make NEW!! You are so cute!! Thanks so much for linking up to Sassy Sites for our Friday ffa party! Have a fabulous weekend! Super cute! I may try this myself! What a great tutorial. The top is so fun. Just so you know… you were featured today over at Sassy Sites! You got a BIG shout out so come by and grab a button! XOXO! This looks so awesome. I really enjoy your blog, btw! I look forward to it in my reader. Found you on I Heart Nap Time. Love it!! Great job! I’m definately going to try this. Will be pinning it right now! I think it’s pretty freaking amazing! Number 1: This is darling, so talented! #2: You are a HOT mama!! This was by far the most viewed link on my link party lat week! You are so cute! It turned out so good! I am featuring you in tonights link party! This was a huge hit at Once Upon a Weekend! Thank you SO much for linking your amazing projects at my party. I am featuring this tonight. And thanks for the great tutorial. I loved reading it, and now I’m itching to try something like this! I like the knock-off better! Great job. I bet something like this could be used for maternity too. I saw a sewing craft in the past week or so from a girl who quilts a lot. she was making something to wear I believe, but the design required turning a lot too. she suggested and used a freeform needle used for quilting so she didn’t have to keep turning, starting and stopping. maybe it would work with this project? Just a thought. purely an amateur sewer, but though it would help anyone who might want to give it a shot. I love how you took a designer shirt and made your own version. Do you think you could do the same with this shirt? I don’t have a sewing background, so although it seems as if it should be simple,I can’t figure it out! Don’t fix “the wierd spot near the armpit”! All the little adjustments make it better! Ooh… just had a thought. What about using a MATERNITY shirt? It’s meant to fit the upper half, but has a lot of extra fabric in the front for gathering/shirring. I’m totally going shopping for some elastic thread! THANKS! I love this! I want to try this with a T-shirt for my daughter!! She’d look absolutely adorable in a shirt like this. Awesome – thanks for sharing! I don’t sew, but maybe I can convince my friend to help me! I already have the shirt and now need the thread! I going to try! So glad you put this together!! I read one comment about a quilting needle, but wondered if you’ve ever looked at a walking foot for your machine? It’s great!! You drop your feed-dogs and more or less just “draw” your seams. No twisting your fabric to follow the seams. 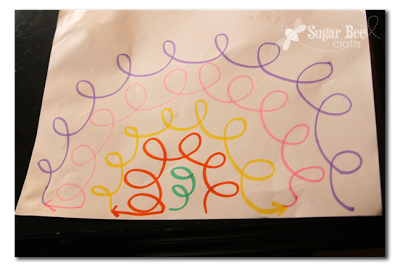 Putting your project in a hoop and spraying it with a starch can also help to keep it flat so to achieve a consistent loop (or what-ever). With knits they will stretch in when put in a hoop but a wash-out fusible stabilizer can also help with that. I look forward to reading more from your blog!! i dont know if anyone has already said this, but if the loops are bigger then the little things that pop will be bigger like they are in the original. Wow you did a great job!! And the little “oopses” you mentioned looks intentional so all was fine!! Can’t wait to try it!! For someone that can’t sew a stich and isn’t an ounce of crafty.. I would love to know where you got the original shirt. It’s fantastic. Great job recreating it! I got it at Downeast Basics, maybe a year or two ago. Love it! I just arrived to your blog from Pinterest, and I love It! Looks great! Now if I only had your body. .. Thanks for the awesome tutorial, what a cute shirt. I will definitely be doing this one. My daughters who hate flowers, and all things ‘girly’ will love this! I just did one of these. I love it! Thank you for the tutorial! I added a row of shirring up the other side as well. I can’t wait to wear it! I’m planning to make a swim outfit (short leggings with a skirt and attached tank) and I’d love to try this with swimsuit material. Very cute! oooh, I’d love to hear how that comes out! Embroiderymad recently posted…A Boy Quilt!!!! I love this!! I agree with the earlier persons post that yours is better. I like your sleeves. 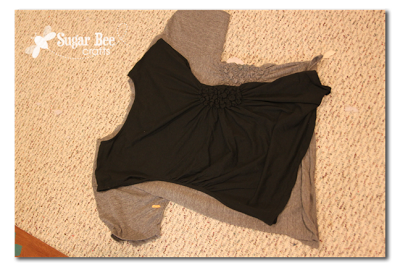 I put it on my pintrest in a file called easy sewing. Now that I have read it I might have to change it. Not sure it would be as easy as I originally thought. I am taking a sewing class in a couple of weeks I may try this after. I love this tutorial. Such a great way to change the look of a shirt. Hi, I haven’t read all the comments so someone may have already thought of this, but I wonder if sewing the loops in free machine embroidery mode (ie with the teeth down) would make sewing the loops any easier? Honestly, I like the part that you thought was awkward, if you had done that a few times around and made it into a flower shape, and it probably would have compensated for the oversized shirt a little more? But it’d probably be more work that way, so nevermind. 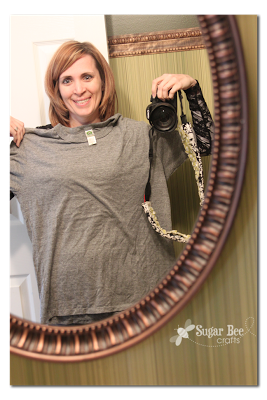 glad you posted your gathered tshirt tutorial. my question is , how do you thread your elastic thread? what kind of needle used?? 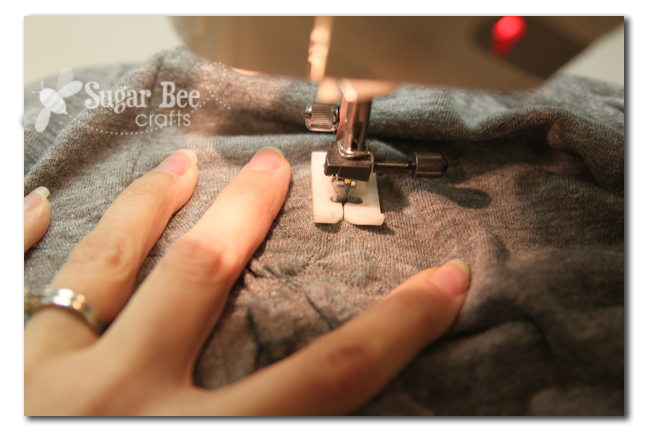 the elastic thread goes in the bobbin only, and it’s handwound – just wrap it by hand. I use a ball needle since I’m working with knit. Good luck! Yours is so much nicer than the bought one. Has anyone tried this by lowering the feed dogs and using a free motion quilting foot? I think it may make sewing the loops easier.